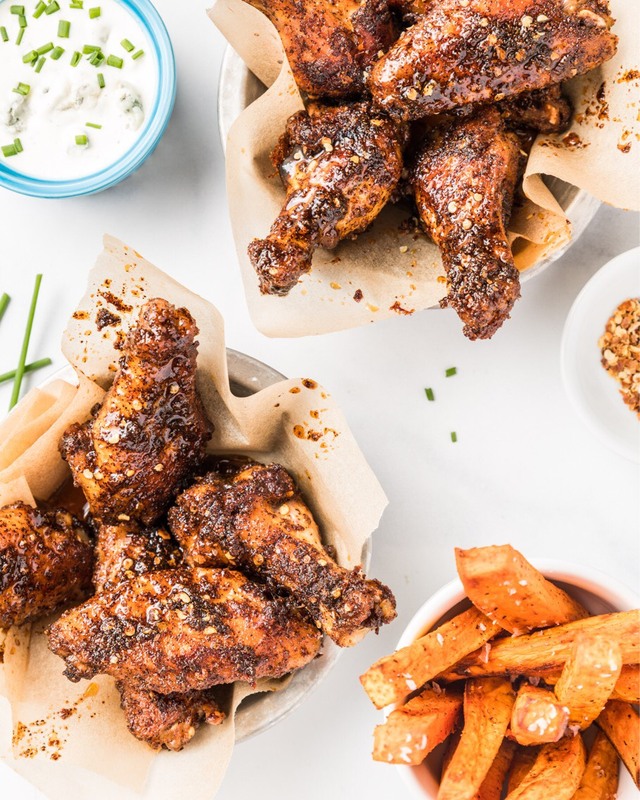 Normally, I post a single recipe at a time—but this trio deserves to be shown together: crispy, subtly spicy (baked) chicken party wings, statement making sweet potato fries, and a creamy gorgonzola dip that is perfect for both the fries and the wings! Friends: I know the Super Bowl is like a month away, but look no further for your new favorite party recipe! My husband and I love fried chicken and we love fries. But if we were to eat deep-fried chicken as much as we crave it, we would have some major health woes. So a few years ago, I experimented with baking chicken and baking fries - and the results were delish! Preheat the oven to 375-degrees F.
Set out a medium-sized baking sheet. Wash and pat dry the chicken wings. Combine everything in a large Ziploc bag. Shake the bag like you’re dancing at your best friends’ wedding. Once chicken has been thoroughly coated, arrange chicken in a single layer on the baking sheet. Cook in the preheated for about 1 hour, or until they wings are crispy and cooked through. 2 large sweet potatoes, peeled and cut into 1x3-inch wedges. Before preheating the oven, position the rack in the upper third portion. Preheat to 425-degrees F. Spray baking sheet with non-stick spray. Place the sweet potatoes and oil into a large bowl and toss lightly, making sure to coat evenly. Sprinkle with salt, pepper, and paprika. Arrnage the potatoes in a single layer on the baking sheet. Bake for 10 minutes, then turn and bake another 10-15 minutes—until potatoes are golden brown and crisp to your liking. Cool about five minutes on the sheet before serving. Enjoy! To make the dip, pulse the sour cream, cheese, mayonnaise, garlic, milk, and lemon juice in a good blender or food processor until combined but still chunky. Season with salt and pepper and top with chives. Cover and refrigerate until ready to sere.